The 70's were pretty rough on Jackie Chan. First, he could only find work as a stuntman because no one thought that he had what it took to be a martial arts star. Second, Lo Wei signed him up to star in films, but tried to make him the next Bruce Lee, something Chan did not want to be. 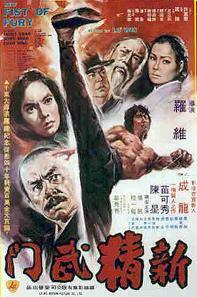 New Fist of Fury is one of the films that Lo Wei directed that tried to make Chan like Lee. While Chan shows that he can command the screen, he is wrongly cast here. Trying to make Chan, not like Lee, but the new Lee, is the wrong way to go. Wei did not care as he saw Chan in a very low light. Wei did not Chan and Chan hated Wei. New Fist of Fury is not a good film. The acting is standard and the fight scenes are average at best. Chan does what he can, but he is at the mercy of Wei, who was bound and determined to make a star out of Chan as he had done with Lee.